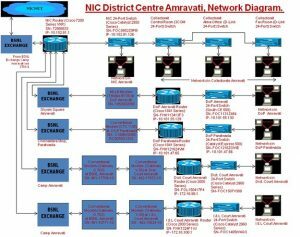 NIC Centers of Amravati District providing the ICT Based Services for e-governance implementation in the District. Centres extending ICT support to Collectorate and other Government Departments for District Administration, Web Services, Training and playing a vital role in pioneering skills in the fields of Information Technology. ICT based Services are being rendered to the Citizen, District Administration and to the various Government Departments by development and implementation of various Software systems. Web services being provided for web site Design, Development and maintenance, Web site hosting and VPN services. Major e-Governance Projects under implementation are Common Integrated Police Application, PRIASOFT, National Social Assistance Program, BRGF and Plan Plus, Land Record Information system, Mahatma Gandhi National Rural Employment Guarantee Act, e- Post, e-Court and IDSP. Implementation of e-PDS in Amravati District for the Digitization of ration cards and automation of supply chain and Godown management and SMS based alert system for the PDS at Amravati. Under NeGP- Agriculture, information on Irrigation Infrastructure is being implemented as a service to farmers. Amravati District is connected to NICNET at Mumbai through high speed fiber optics 100 Mbps connectivity for providing ICT services to district administration. District is providing VC facility. Common services Centres are set setup and operational at village level for issue of Record of rights and other Citizen centric delivery services at their door step. Citizens are benefited by means of this and transparency being maintained. Vasantrao Naik Setkari Swavalamban Mission portal (http://vnss-mission.gov.in) is to provide information of various schemes that are implemented by the Government for farmers and thereby solve the problem of farmer-suicide in the division. Video Conferencing facility (EVCS) is being utilized regularly by Government of India and Government of Maharashtra departments for review of National and state Schemes. Web-Connect and e-Learning Session with NIC, New Delhi and Mumbai are being arranged for the officials of varies departments for National and State Schemes, Projects and Participated in skill developments programs through e-Learning Session. Web services are provided to the various State Government Departments and District Administrations. Brief Description:- Administration was facing difficulty in Tapal Tracing and tracking due to huge number of references comes for DM recognition and that are distributed among different sections in collector office according to the reference subject. Some types of entries were taking by IO sections, OIC’s in collector office and the responsible clerk which was creating repetition of work. Also the tracking of important reference becomes critical due to huge number and personnel interest of malpractice employee. To overcome and deal with situation online tapal entries, tracking and status monitoring become essential of administration. Brief Description: This Software is for maintaining the details of project affected peoples in district Such as Persons Name, address, qualifications, project name and category etc. and generates varies reports useful for the district Administration. It is also useful for the recruitment of the project affected persons in varies departments of Amravati district. Brief Description: This Software is designed and developed as per instructions of Commissioner (Revenue), Amravati for keeping track on the letters, DO received to Commissioner Office and their disposal. This is being used for maintaining the information of References received, Forwarded to concerned Department or sections with Commissioners remarks, progress of References, action taken and disposal. Brief Description: This Software is designed and developed for assessment of target and achievements of revenue officers. This is being used for maintaining monthly information of Revenue recovery, Food supply, Land Acquisitions, Resettlement, Accounts, and Home etc. System being implemented at Tahsil, SDO, District and division level for Revenue Department. This system is hosted on http://mahasim.nic.in. Brief Description: Vasantrao Nail Satkari Swavalamban Mission Web Site is developed as per the instructions of Director General, VNSS Mission, Amravati and SIO, Maharashtra. VNSS Mission covers Seven Districts namely Amravati, Yavatmal, Washim, Akola, Wardha and Buldhana. Web interface provides various Government resolutions of Maharashtra Government for the benefit of Farmers. It Provides Reports on the Causes of Farmers’ Suicides from TISS and IGIDR. It also provides the link to the farmer suicide affected District web site. http://amravati.gov.in is designed and developed for providing information, Activities, and News of District to the people and Government officials. Detailed Information related to the Legend/Leaders of Amravati District (Gadge Baba, Tukdoji Maharaj, Dr. Panjabrao deshmukh), Ancient History, Middle aged history, cotton belt history, information related with Turism, climate, Tribal people, Tribal development process and Farmer development in the district. Web site provides Rare photographs and maps of revenue village, economical representation, Forts, Forest area, Tourist interest places, geography and wild animals photos. Brief Description: Official website of Divisional Commissionorate Amravati, http://amravatidivision.gov.in is designed for providing information of Divisional Commissioner office to Public and Government offices. Information consists of the Revenue Division, Districts, Photo gallery, Maps, Office Information, RTI information and Amravati Division Darshan etc. Web site provides information of recent News and updates. It also provides the link to the national, state and District of Amravati Division namely Amravati, Yavatmal, Washim, Akola and Buldhana web sites. Brief Description: The official website of Melghat Tiger Project Website is designed for providing statistical, Graphical information of Melghat Tiger Project, Amravati to Public and Government offices. Information consists of the Habitats, Tribal, Flora-Fauna, tourism, Visuals of Birds, Animals, Butterfly, Forest Maps, RTI Information and Check list of Forest Assets. Beauty of Melghat is lies in Melghat Tiger Project Web site. URL of website is http://melghattiger.gov.in. Brief Description: The official website of Chief Conservator of Forest (Territorial), Amravati http://ccftamt.gov.in is designed for providing information of Chief Conservator of Forest (Territorial) office to Public and Government offices. Information consists of the Forest Divisions, Flora-Fauna, Eco- tourism, Photo gallery, Forest Maps, Office Information, RTI information and Guide to the melghat Tourists for Accommodations, food etc. Brief Description: The official website of Special Inspector General of Police Amravati Range, Amravati. Website address is http://igpamravatirange.gov.in/. Website designed for providing information of IGP office Amravati to Public and Government offices. Information consists of Hall of Fame, Administration, Contact details, Welfare activities, Crime details and RTI information. Information also consists of district administration for SP offices. Name of User Department:(Central/State/District) :- Divisional Commissioner Amravati. Brief Description: This S/W is developed for registration of graduate electors for the Amravati Graduate Constituency Election as per instructions of Commissioner and Electoral Registration Officer, Amravati. Software tested at Commissioner Office, Amravati and implemented at Amravati, Akola, Buldana, Washim and Yavatmal Districts for registration of graduate electors. Name of User Department:(Central/State/District) :- Amravati District. Brief Description: This S/W is developed for maintaining details of counting staff such as Static Observer, Counting Supervisor and counting assistant. Randomly deployment of counting staff assembly and table wise for Counting of Votes. This software is implemented for Elections in Amravati District. MGNREGA scheme for the poor being implementing effectively in all tahsil of Amravati District. Labour Registrations, job cards, work demand, Works details, allocation of works, muster and fund received being entered online through tahsil and CSC centers. Almost all works in this scheme are in melghat, tribal region of Amravati district. National Social Assistance Program for the users at different level for to maintain Pensioner Details, estimate budget for pension, allocate funds for disbursement of pension, maintain pension disbursement details, capture verification information of pensioners and generate reports as per the role assigned to them. The objective of the system is to ensure that the Old Age Pension is received by all the beneficiaries. The Allocation of Funds and its utilization by the states is available on the web site. The web based application will facilitate the Ministry of Rural Development (MoRD) to closely monitor the utilization of funds allocated for NSAP. Video Conferencing and e-Learning Services. Video Conferencing facility (EVCS) is being utilized regularly by Government of India and Government of Maharashtra departments for review of National and state Schemes. For VC session coordination with the concerned department, keep track on upcoming sessions and record of VC Sessions held and VC sessions preparations. ICT supports also extended to MSWAN Commissioner and Collector office VC Sessions. Web-Connect and e-Learning Session with NIC, New Delhi and Mumbai are being arranged for the officials of varies departments for National and state Schemes, Projects and Participated in skill developments programs through e-Learning Session. It is a Government of India Project for Computerization of Village Forms VII-XII and Property Card. Main aim of this project is to issue Computerized Record of Rights to the citizen of this district. ROR being made available to the citizen through district web site and http://mahabhulekh.mumbai.nic.in portal. This project is implemented effectively in all tahsils of Amravati District. Centre providing web hosting services to the various State Government Departments and District Administrations. Government Web Sites are hosted on nic.in and gov.in Domains. The web hosting services rendered are Registration, Staging Server, Security Audit and Launch on Production server. Support/Training/Demonstration given to the Forest department personnel and to the officials appointed in the Collector office. Now the work of taking area lay-out using GPS and then uploading on the tribal department website is going on. Also support for superimposing the lay-out taken from GPS on remote censing GIS image of 2005 and 2007, similarly on Google earth to find out the exact situation of land (Land should not be forest covered, river portion, hilly areas, and NA arrears) before awarding it to the tribal peoples. National Knowledge Network would encourage sharing of knowledge, specialized resources and collaborative research among scientists, researchers and students from diverse spheres across the country to work together for advancing human development in critical and emerging areas. BRGF Scheme is being implemented in Amravati District for the development of District. Planplus is used for decentralized planning and preparation of District plan. As a part of the Planplus Implementation conducted three Workshops for the Officers and staff of DRDA, Panchyat Samities, DPO and Municipal councils. Village level plans are being prepared with technical support of NIC. e-Post is a National project for Computerization of Post by using applications iMO, Speed Post Track & Trace, Public Grievances (CCC), India Post website, Money Order (MO), RTI Software. e-Post is a service under which printed or even handwritten messages of customers are scanned and transmitted as email through internet. At the destination offices, these messages are printed, enveloped and delivered through postmen like other letters at the postal addresses. For this purpose, e-post centers have been set up with STM1 Connectivity in the Amravati and Parathwada Post Offices. CIPA is being used by the police department for Registration, Investigation and Prosecution. This system is being implemented in all nine police stations of Amravati Commissionorate. A Workshop is conducted at Commissioner of Police Office, Amravati for all the officers and Police Constables in Co-Ordination with SCRB Pune. About Seventy five officers and Police Constables were participated in three days workshop. Web based reporting of crimes significance for commissioner of Police and Rural Superintendent of Police areas in the district. All information is web based helps police personnel in Detention of criminal and solves cases. To provide access to legal and judicial databases to the judges. The project aims at improving operational efficiency, co-ordination, accessibility, speed in judicial administration and to set Information Communication Technology (ICT) infrastructure at Consumer Redressal forums all over India to provide IT solution at each level in order to provide E- Governance, Efficiency, Transparency and Systematizing of working in achieve time bound delivery of justice to the consumers. 8th All India School Education Survey work is stared in Amravati district. Data collecton work from all school and all villages is completed, now the digitization of the survey inputs is being implemented. The National Rural Health Mission seeks to adopt a sector wide approach and subsumes key national programmes, such as: the Reproductive and Child Health (RCH-II) Programme, the National Disease Control Programmes (NDCP) and the Integrated Disease Surveillance Project (IDSP). NRHM will also enable the mainstreaming of Ayurvedic, Yoga, Unani, Siddha and Homeopathy Systems of Health (AYUSH). Given that health is so critically linked with nutrition, water and sanitation, NRHM includes strategies for operational convergence to ensure that there is demonstrable synergy between these sectors. Integrated Disease Surveillance Project is a decentralized, State based Surveillance Program in the country. It is intended to detect early warning signals of impending outbreaks and help initiate an effective response in a timely manner. Major components of the project are : (1) Integrating and decentralization of surveillance activities; (2) Strengthening of public health laboratories; (3) Human Resource Development – Training of State Surveillance Officers, District Surveillance Officers, Rapid Response Team, other medical and paramedical staff; and (4) Use of Information Technology for collection, collation, compilation, analysis and dissemination of data. Updated information of Panchayat Raj Institutions for maintaining details of needs and amendments passed in Village, Block and Zilla panchayat members meetings. The primary focus of the PMGSY is to provide All-weather road connectivity to the eligible unconnected Habitations. An All-weather road is one which is negotiable in all seasons of the year. IAY is the flagship rural housing scheme which is being implemented by the Government of India with an aim of providing shelter to the poor below poverty line. The Government of India has decided that allocation of funds under IAY (Indira Awas Yojna) will be on the basis of poverty ratio and housing shortage. The Watershed Development Programme taken up under IWDP and EAS are monitored by DRDA. This is a National Project for Animal Diseases Reporting System being implementation at all Block level of Amravati District. Initial site survey has been made and hardware is receiving, District and block level Nodal officer are appointed for implementation. State Level Database created at SDC Maharashtra. Treasury Net having following modules being implemented in district. Registration, renewal of candidates, Employment information generated over net, publication of seniority list and information of self employment. Rashtriya Swashtha Bima Yojana (RSBY) is introduced by Ministry of Labour and Employment, Government of India to provide Health Insurance to the BPL families. In first phase RSBY is being implemented in Amravati along with other seven Districts of Maharashtra. The operation of the system involves three stages enrollment, hospital transactions and monitoring. Property card information system is being implemented in Dy. Superintendent of Land record offices of Amaravati district. Regular Mutations are taking using software and hosting the updated property cards data on district website for public use. TILR offices selected for pilot implementation of CODISS software ware completed and now they are doing regular data entry of records in record room.